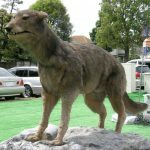 The Hokkaido Wolf is a subspecies of the gray wolf, and is one of two extinct wolves from japan, with the other one being the ‘Honshu Wolf’ or ‘Japanese Wolf’. Like the Honshū, the Hokkaido originated in the Asian mainland and was known for its large size and predatory instincts. During the famous Meiji Restoration in Japan, the local farmers expressed their interest for having their own American-style ranches to raise livestock. During this time, a US farmer named Edwin Dun began importing livestock to Japan. Soon after, the local Hokkaido wolves began preying upon these livestock, and they experienced significant development during this period. The owners took to killing these carnivores using strychnine poison since they posed a direct threat to their livestock. Incidentally, the Meiji government also promoted and supported this at the time. Another theory suggests that, in 1878, a large population of wild deer and other minor herbivores starved to death because of the unavailability of natural vegetation. This, in turn, had a severe negative impact on these wolves, since they had to depend upon them for survival. 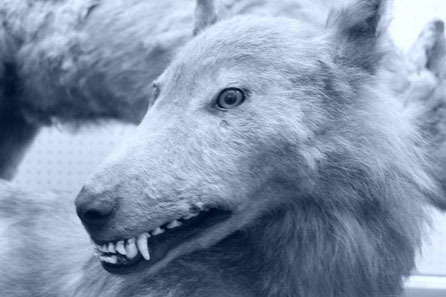 A bounty was also placed on the wolf, but it officially became extinct in 1889. Since its extermination, there have been several reports from people claiming to see the animal. However, these sightings have never been verified. 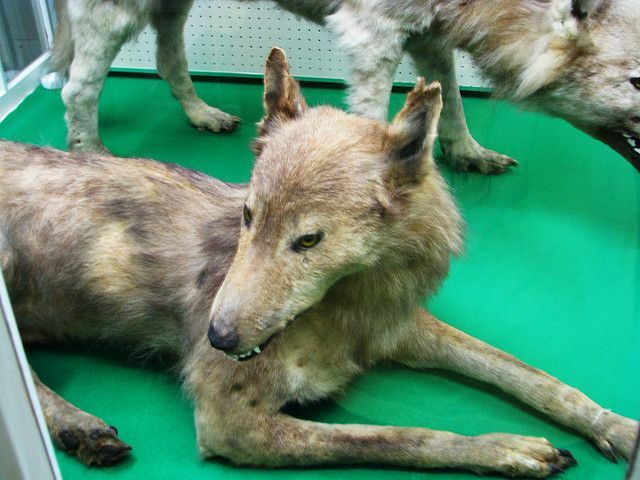 One theory also suggests that, the animals that have been seen or heard howling were nothing but a wolf-dog hybrid. By size, dimensions, and other features, the physical characteristics of the Hokkaidos were closely related to the modern-day standard gray wolf. The skull/head was quite large and robust, with the jaws lined with long, curved canines as an adaptation to having a good grip on the prey. Their coat was usually light grey to tannish grey in color, with dark guard hairs running along their back. The wolves stood about 70–80 cm at the withers. They were generally very lean, but had an exceedingly muscular body. Like most other wolf species, these carnivores were chance predators that would prey in packs. This behavior assisted them in predating the livestock of the Japanese farmers. They were nocturnal and would be active between dusk and sunrise. The primary prey of the Hokkaido wolf were deer, rabbits, birds, and other small to medium-sized animals. Hokkaido wolves are direct descendants from the mainland Siberian wolves. 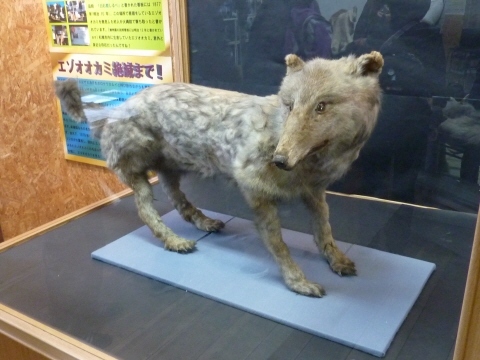 Previously thought to be an independent species, the Hokkaido wolf was classified as a subspecies of the gray wolf by Japanese archeologist Kyukichi Kishida in 1931. 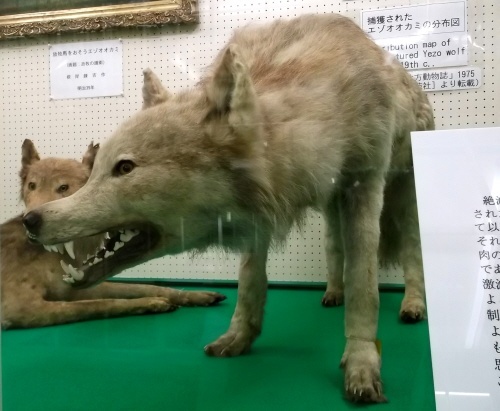 The wolf held a unique position among several Japanese tribes, like the Ainu tribe that identified the wolf with the deity Horkew Kamuy (meaning ‘howling god’), since both had similar hunting habits. Published on October 10th 2018 by admin under Mammals.